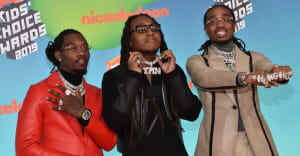 The Migos rapper responded to a fan’s petition. When an ambitious Migos fan started a petition last week calling for Quavo to add a verse to "The Star-Spangled Banner" the internet stepped up. Over 7,000 people backed the idea and Quavo himself said he was ready to roll. Speaking to TMZ on Tuesday, Quavo expanded on his possible involvement in a new anthem and said he was more interested in making something completely new for the modern era.